75% to 80% of lead acid batteries fail prematurely because of formation of lead sulfate on the plates. These crystals cause batteries to become unusable at approximately one-third of their natural life. The Battery Life Saver electronic desulfator handles this problem. 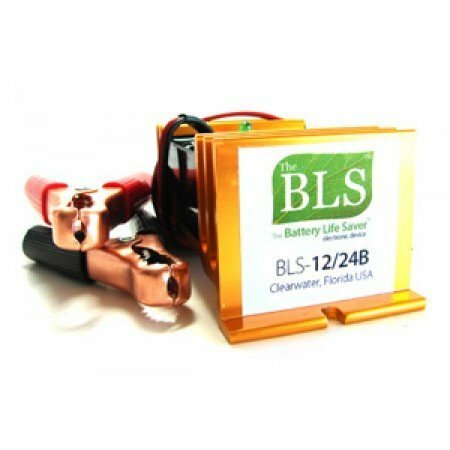 How does it Work?The Battery Life Saver sends a frequency signal to each crystal of lead sulfate, causing it to dissolve into lead and sulfuric acid. This restores the battery to its original condition and allows the electrical charge to be drawn from the battery. Benefits of Using The Battery Life SaverIt rejuvenates old batteries, maintains working batteries in optimal condition, and extends battery life, saving time and money. With the Battery Life Saver, more power is available from your batteries and you need less power to charge them. By reducing the number of batteries that get thrown away and put in landfills, the Battery Life Saver helps to protect the environment. This model is designed for 12 and 24 volt solar/wind battery banks. Similar to the BLS-12/24B, but the wires are 4' in length to span 8'. Comes with alligator type battery clips for attachment New for 2012 - 5 year warranty! 120 day money back guarantee! If you have any questions about this product by Basandi, contact us by completing and submitting the form below. If you are looking for a specif part number, please include it with your message.